This is simply not true—and had the Times asked us whether it was, we would have explained the reality of what happens when Uber grows in a city: riders enjoy lower pick-up times and drivers benefit from less downtime between trips. It’s a virtuous cycle that is widely acknowledged in business and academia, and which is backed up by data. Graphic shows changes over time in the five largest US Uber markets. The same month each year (June) is shown to adjust for seasonality. “ETA” reflects the average wait time for a rider requesting a ride. “IDLE TIME” reflects the percentage of each hour spent signed into the app that a driver was not with a rider, and was calculated as the median across drivers. 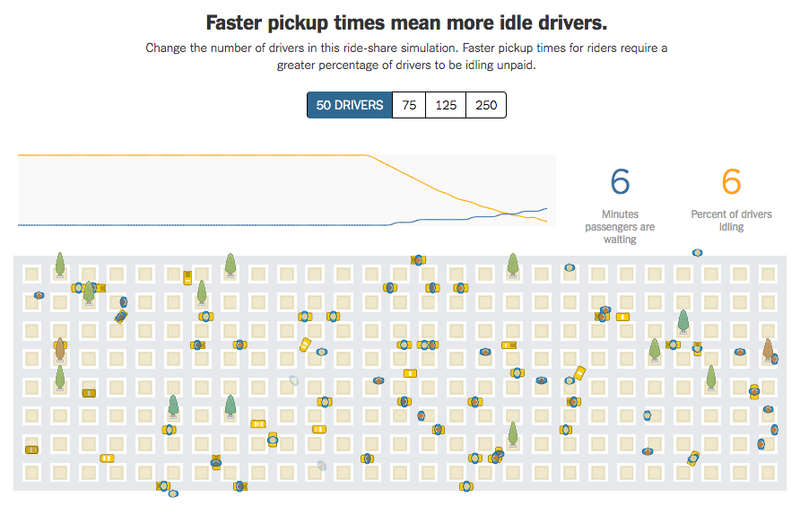 “DRIVERS” represents the number of active drivers per month in a city completing at least one trip a week. Numbers have been normalized for comparison. Maximizing the efficiency of cars on the road also helps cities use existing infrastructure more efficiently, while minimizing congestion. Indeed, research from 2016 showed that Uber was already more efficient than pre-existing on-demand options, and we’re excited about those trends getting better over time. First, it appears to treat demand as fixed—in other words, there is a fixed quantity of riders in the simulation, no matter how good the service is. This cuts against a fundamental tenet of transportation economics: if you make a service more compelling and convenient, you attract more demand. Indeed, as our service quality has improved through lower wait times, we’ve seen the overall market grow. In some cities, Uber is now several times larger than the entire pre-existing taxi market. Second, and more importantly, the simulation assumes that the number of drivers on the road is both fixed and set by Uber. Neither is true: drivers choose to start or stop driving on a regular basis, and will only drive with Uber if and when it makes sense for them. 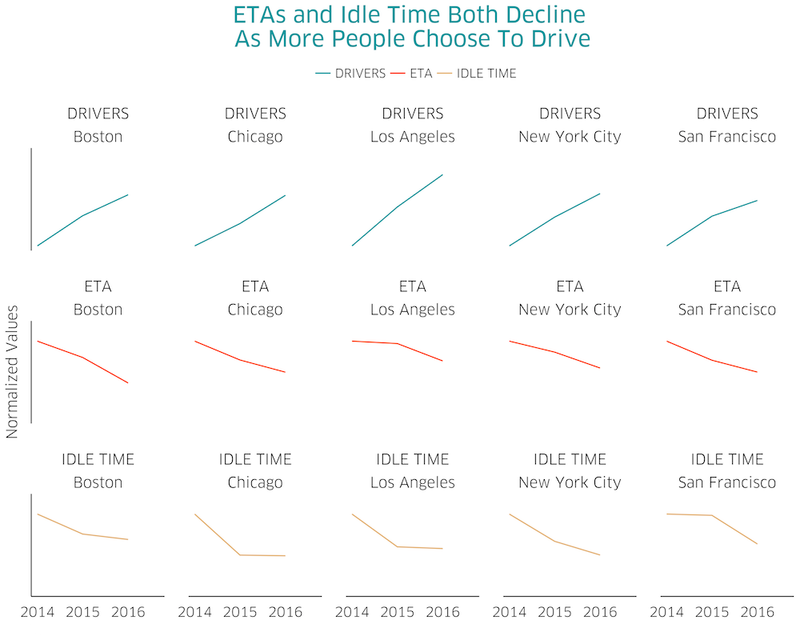 If we were able to impose a situation where 80% of drivers’ time was idle, drivers would leave the platform in droves to work with competitors—or leave ridesharing altogether. This is not reflected in the graphic, where it appears an all-powerful hand can fix the quantity of drivers on the road at any one time. In fact, recent research has confirmed that one enormous economic benefit of Uber to drivers is the value of schedule flexibility. So what does it all mean? Happily, evidence to date has shown that all three things can happen simultaneously: we can grow the overall number of people who have access to work with Uber while reducing wait times for riders and reducing the amount of time drivers spend idling. That’s an exciting set of evidence for the future of on-demand transportation.